American Airlines (Dallas/Fort Worth) has introduced its AirCal heritage jet scheme (painted in the 1981 livery) on Boeing 737-823 N917NN (msn 29572). Top Photo: American Airlines. N917NN in the 1981 AirCal color scheme. Below Copyright Photo: Bruce Drum/AirlinersGallery.com. The original Air California/AirCal. Boeing 737-293 N464AC (msn 19309) is pictured at Seattle/Tacoma in the final 1981 livery. This entry was posted in AirCal (Air California), American Airlines and tagged 19309, 29572, 737, 737-200, 737-293, 737-823, Air California, AirCal, American Airlines, Boeing, Boeing 737, Boeing 737-200, N464AC, N917NN on November 29, 2015 by Bruce Drum. 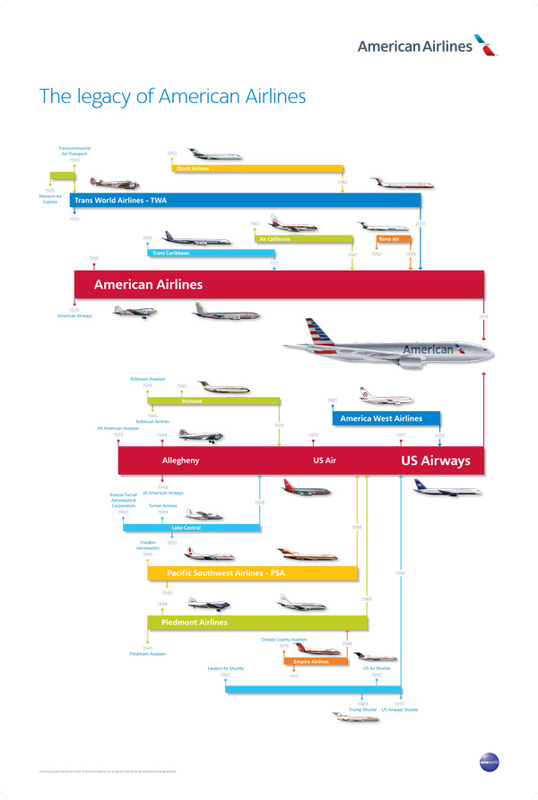 Starting this month, American Airlines will be upgrading the premium experience for its customers and paying tribute to the proud history of its employees around the world with all-new amenity kits for most international and transcontinental flights, featuring special, limited edition kits that honor nine airlines that laid the foundation for the new American. Every First Class and Business Class kit contains an improved collection of personal care products selected specifically for the modern traveler. The new amenity kits represent the latest in $2 billion in investments as American continues “going for great” with fully lie-flat seats; international Wi-Fi; more in-flight entertainment options and power outlets; a new, modern design for Admirals Club lounges worldwide; and an upgraded assortment of complimentary healthy food, cocktails and more. 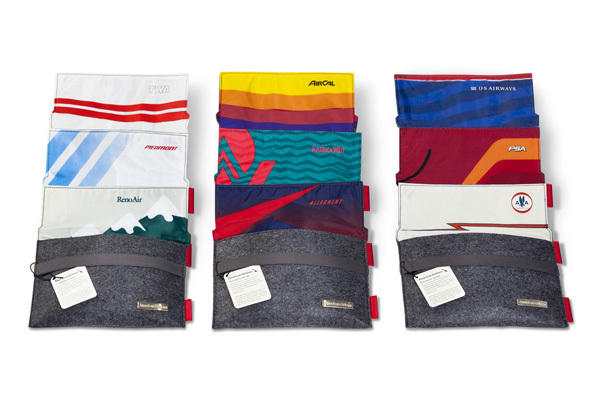 Above: The TWA amenity kit. While these kits play up American’s retro branding, the airline took a forward-looking approach to selecting the personal travel products contained inside. The heritage amenity kits in international Business Class contain fabric lining, a pair of socks and an eye mask styled with the colors of a specific airline, a toothbrush and toothpaste, Scope® mouthwash, covers for Bose® QuietComfort® Acoustic Noise Cancelling® headsets provided with each seat, earplugs, a pen, tissues and hand lotion, lip balm and wipes by red flower. 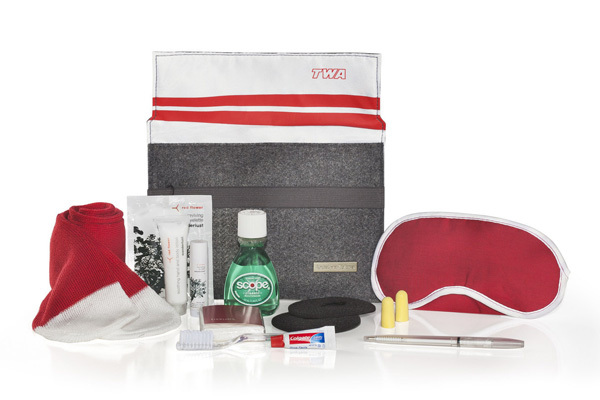 The heritage amenity kits in transcontinental First Class contain the fabric lining, socks and eye mask with airline branding, a toothbrush and toothpaste, earplugs, and the trio of red flower products. International First Class customers will receive new, larger kits, containing a pair of plush socks and an eye mask, Scope® mouthwash as well as covers for Bose® QuietComfort® Acoustic Noise Cancelling® headsets, a toothbrush and toothpaste, earplugs, pen, tissues and the three red flower products in addition to red flower’s face lotion. Customers will also receive upgraded pajamas in a color-block pattern and non-skid, 100 percent cotton terry slippers. In addition, for the first time, American is rolling out amenity kits in Business Class on its transcontinental service between New York and Los Angeles and San Francisco, as well as Miami and Los Angeles. These kits contain a pair of socks and eye mask, a toothbrush and toothpaste, earplugs, and the trio of red flower products. 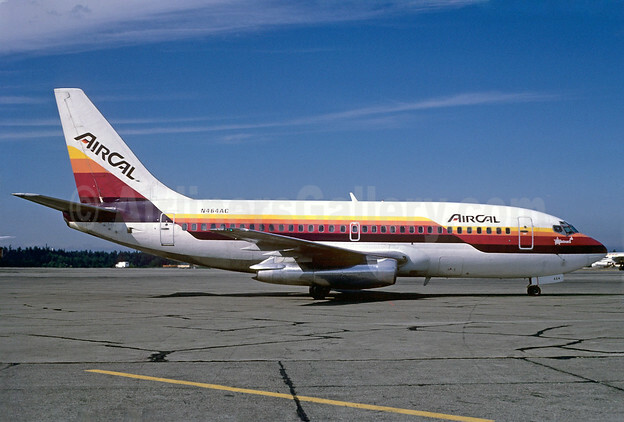 This entry was posted in AirCal (Air California), Allegheny Airlines, America West Airlines, American Airlines, Piedmont Airlines (1st), PSA-Pacific Southwest Airlines (1st), Reno Air, TWA-Trans World Airlines, US Airways and tagged Air California, AirCal, Allegheny Airlines, America West Airlines, American Airlines, Pacific Southwest Airlines, Piedmont Airlines, PSA, Reno Air, Trans World Airlines, TWA, US Airways, USAir on February 3, 2015 by Bruce Drum.